AV Ernst Meyer-Margreth (1898 - 1983), Hamburg, Germany, designed this Propylaeum -- a classical Greek style monumental gateway to a special enclosure. Such gates were very popular during the late 19th and early 20th century. They were part of the neo-classical movement in architecture. The Classical Set (Introduced in 1932 by New York office -- not Richter company product.) includes a similar design. 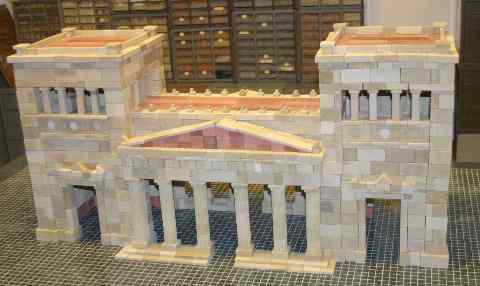 You will find more pictures of this Propylaeum on the "builder's page". The plans were drawn by AV Burkhard Schulz and are available on the web in the form of PDF files. The Anchor factory in Rudolstadt will hold a meeting "Treffen" on Saturday, September 5th. I have already booked my flights. I plan to be there. Next CVA meeting: Saturday, October 24, 2009; Hotel Lapershoek in Hilversum. Factory Treffen: Saturday, September 5, 2009; at the factory. Dordrecht: Simon van Gijn - Museum aan Huis; Nieuwe Haven 29-30. Until November. You can now download almost the entire CD-ROM archive from a new web site. Go down to the bottom of the page and click on "Site-Map" to find what is currently available. The site is still "under construction" (noch im Aufbau). Use of this site is much easier, quicker, cheaper, and more convenient than buying the CD-ROMs. Please use it! And you can download my book as a PDF file -- English version or German version. All sets -- #s 6 through 30A, and NS conversion set -- are now in stock! If you are interested in Anchor building designs, you have two choices for software: AnkerCAD and AnkerPlan. For those of you who are interested, here is a picture of me. My picture is relatively new, taken in October, 2008, on a trip to Antwerpen. AV Rob Buis has been producing reproduction metal parts of the highest quality. To find out which ones are still available you should e-mail AV Rob Buis. Yes, they are expensive, but if you want to build Anchor bridges using nickel-plated iron parts, you will find that most of the original parts are rusted, often bent, and very hard to use. I build with Rob's parts. Contact Rob for more information about his new Anchor metal parts. Rob has a web site for his reproduction metal parts. This web site is newly revised and expanded -- with a lot of beautiful pictures. He has also established a web site for box # 10 and box # 10B. The last CVA meeting was on Saturday, April 25, 2009. The next meeting date will be on Saturday, October 24, 2009. See the CVA page for details. In addition the new Anchor factory in Rudolstadt, Germany held three "Treffen", or "open door" days, at that factory during 2008 -- Saturday, July 5th; Saturday, September 20th; Saturday, December 13. I attended the September 20, 2008 Treffen. I will attend the Treffen on September 5, 2009. The Club of Anchor Friends (CVA) has published a Stone Catalog. The new printing has been done, and the catalogs have been sent to CVA members. There is already a list of pages being revised. Not major omissions, but changes worth making. The new CVA Stone Catalog will not be offered to the general public until the pages have been revised. CD-ROM Archive:: You can now download almost the entire CD-ROM archive from a new web site. The CVA's CD-Archive: More scans are being added all of the time, and the "holes" in the documentation are being filled. For CVA members only, there are 9 CD-ROMs of the old MLBs (including an overview CD-ROM) and 3 CD-ROMs of the AHN (including an overview CD-ROM). (Do not try to buy these MLB CD-ROMs unless you are a CVA member. I check the membership list!) All of the scans are JPG files. If you cannot find what you want on the Internet, feel free to e-mail me. For the month of August, 2009.